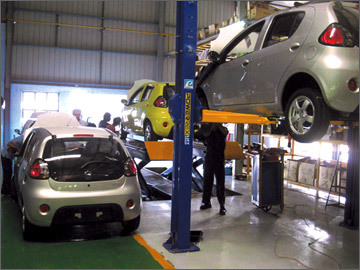 Micro Cars Ltd, the local automobile manufacturer and assembler has created history once again as the only Sri Lankan company to export its range of vehicles to the International market. Micro cars launched its range of Sedan and MPV Junior minivan with its Franchisee, Lotus Global International (Pvt.) Ltd on July 10 in Katmandu Nepal. The launching ceremony was a success with all the units being sold on the first day. The First Secretary and many delegates from the Sri Lankan Embassy represented this event to solicit the relationship between the two nations. Micro Holdings (Pvt) Ltd Chairman Dr Lawrence Perera said launching Micro Cars in Nepal is a historic event. 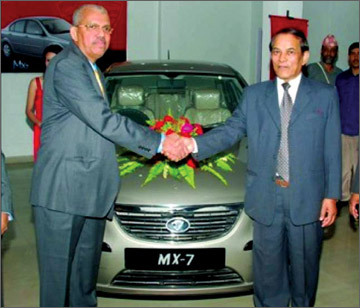 “While looking at the current demand and the acceptance from the customer base of Nepal, it is evident that vehicles manufactured or assembled in Sri Lanka would certainly capture a fair market share and win the hearts of the Nepali people in a short span of time. Micro cars over the years have recorded a steady progress in its growth and today we are proud to be in association with one of our closely associated country Nepal. “Our vehicles are packaged with many advantages in terms of Value for Money, affordability, spare parts availability and a good partner who will provide the best of after sales facility, style, comfort, luxury, durability spacious interior, low fuel consumption are some of the added benefits that customers could enjoy with Micro. Micro Holdings (Pvt) Ltd Group Director C P Guhashanka said a pre study of the Nepal automobile market was done prior to the launch and we have been very selective in promoting our range which is suitable for the Nepal road conditions. “We see a huge potential in this market. Our initial launch has already proven to be a great success. We intend expanding our market share by providing attractive prices for technologically advance high spec vehicles. “With the forthcoming orders will be very soon hitting a sales volume of close to 135 units within the first six months. Franchisee Lotus Global International has equipped a fully-fledged showroom specially for Micro Cars sales and services facility,” he said. “Micro has set foot to the international market by exporting its cars to Nepal, South Africa, Pakistan, Sudan and we are finalizing in establishing our Franchise Agents in Bangladesh and Cambodia within the next three months,” he said.